The San Antonio Spurs are just four games into the regular season and head coach Gregg Popovich is showing that he is going to take his playoff strategy to a new extreme this season. On Thursday against the Houston Rockets, a nationally televised game on TNT, both Tim Duncan and Manu Ginobli did not play and the Spurs were blown out 98-81 in a game that wasn’t even that close. It is no secret that Popovich likes to occasionally rest his ageing stars during the regular season, in effect sacrificing entire games to make sure his best players are well-rested for the playoffs. But it is a little jarring to see the dreaded “DNP (did not play) COACH’S DECISION” so early in the season during what should have been a fun matchup against their intrastate rival. This is a strategy Popovich has been using for a few seasons now. During the 2010-11 season, Popovich did rest his stars, but he did not rest more than one on the same night until the final week of the season. 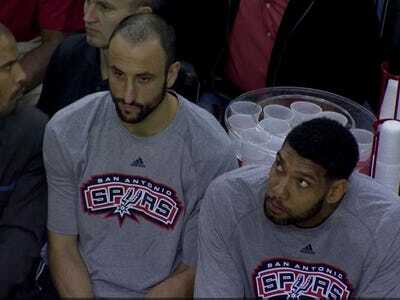 During the lockout-shortened 2011-12, we start to see Popovich move his strategy to the middle of the season when he sat Duncan and Tony Parker during the 33rd game of the season, a 40-point blowout loss on the road against the Portland Trail Blazers. Ginobli also missed that game with an injury. 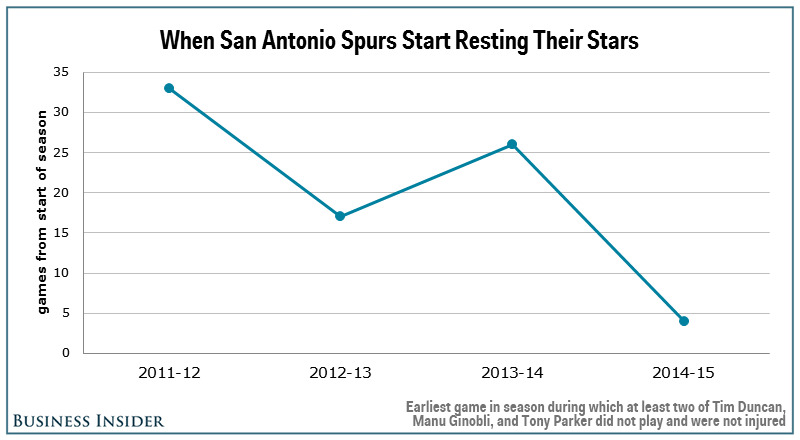 In the next two seasons, the Spurs started resting their stars earlier, but never as early as this season. 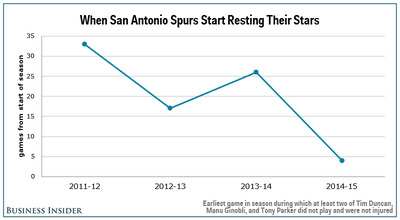 The move always happens on the road against a good team and on days when the Spurs had a game the night before. Clearly the strategy is working as the Spurs are the defending NBA champs. So it is hard to argue with Popovich’s strategy. But at this rate, the Spurs are going to have their stars miss a lot of games this season and a lot of fans hoping to see some of the best players in the game are going to be disappointed.